On warm summer days, you will hardly find such a lovely place. Tavira Lounge restaurant rests on a privileged spot in picturesque Tavira, one of the few unspoilt gems of the Algarve region, right next to the Gilão River and overlooking the Roman Bridge. Inside, you will find a casual, modern look and feel, coupled with a number of windows scattered throughout the main room, offering guests a stunning view over the river while they quench their cravings in one of the most sought-after restaurants in town, both by locals and foreign visitors. Tavira Lounge restaurant is known for their caring and professional team, who usually seek to show guests with the best service there is. The menu at Tavira Lounge restaurant boasts an eclectic variety of delicacies sharing distinct origins. On one hand, the Mediterranean-inspired tapas and bruschettas are probably the best reason to visit this restaurant and lounge bar as often as you may like. 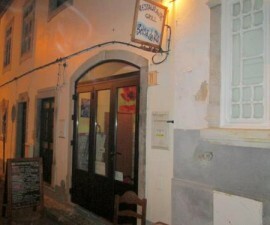 On the other hand, Portuguese cuisine was not forgotten and is mainly depicted through the homemade desserts. 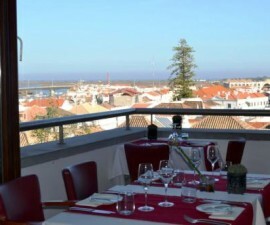 The excellent choice of wines, beers, and cocktails will make up for a pleasant afternoon at the terrace overlooking the river and breathing in the atmosphere of Tavira and its hidden beauties. Another of Tavira Lounge’s perks is the fact that it can change environments from day to night time. During the day, it is a seemingly quiet coffee & snack bar, where you can even take your children to and let them play at the kids’ area. During the early evening, it transforms into a somewhat sophisticated restaurant ideal for any kind of occasion or celebration, as well as entertaining business partners. Later on, you can easily have a taste of some of Portugal’s most stunning wines at the wine bar, although there is a virtually far-reaching international wine selection. The owners, Katia and George, will surely be by your side during your visit, as they make it a habit to talk to each and every guest that comes in to their cosy establishment. Also, the prices range between € 4 and € 20, depending on what you are feeling like. And as if this wasn’t enough, you can use the free Wi-Fi at the Tavira Lounge restaurant to check your emails as you sip on a cocktail or try a piece of their amazing chocolate cake or let yourself melt into the delightful world of chunky meatballs, cod croquettes, garlic & piri-piri prawns or any other amazing snack from the menu.